Got friends coming in from out of town? Need for them to stay somewhere cheap and convenient? Check in to The Little Blue Window Hostel in BTM for happy vibes, budget living and friendly accommodation. 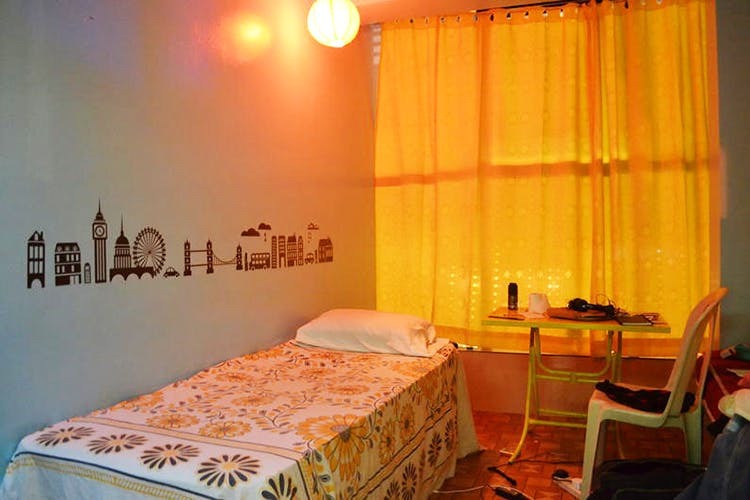 Located in BTM Layout, the hostel is ideal for students, backpackers and travellers making a pit stop in Bangalore before heading out again or coming in to explore the city. BTM Layout is aptly located near malls, shops, restaurants. The hostel is a spectrum of colour, with the walls, furniture, decor all spellings out lots of it! There’s lots of things to do at the hostel. You can meet new people, socialise and relax in their lounge area. Or, challenge someone to a game of darts and see if you can oust them. If you’re in the mood to relax, sit down in the lounge area with a book or a movie and chill out. There’s also a terrace area for you to enjoy! In terms of food, you can get basics like tea and coffee here but for the bigger meals, you might have to head out. The hostel offers free WiFi and cable TV facilities too. The hostel has no bunks, but rooms with single beds which you can book. There’s one for just women to book and there’s one just for men. There’s also an economy double room that you can share if you’re taking a friend or your S.O along. Each room has its own linen, attached bathroom, plug points and lamps. There is adequate storage for your luggage too. A single bed costs INR 549 and if you’re booking the entire room, it costs INR 1,099. Which means you have more money to spend on having fun in Bangalore city! You’re in BTM Layout, so there’s a load of things to do around. You’ve got a KFC and a McDonald’s right outside the hostel so you’re set with that. And transportation is easy with cabs around. So you can get around to the entire city. There’s also the Disney Bakery nearby, for some tea and snacks. You can also go to the nearby Pollamma’s Mess for some Andhra Meals. To book a room here, check out the hostelworld website.